The Department of Transport has announced that from 1 April 2016, on expiry of the Northern Rail franchise, the new operator will be 'Arriva Rail North' a subsidiary of Deutsche Bahn, the state-owned German national railway, rather than Abellio, a subsidiary of Nederlandse Spoorwegen, the state-owned Dutch national railway. Arriva already run the trains in Wales and the Borders, the Cross-Country network, and some other UK routes. The documents released by the DfT tell of 98 brand new trains (281 carriages), which along with the electric trains currently being transferred from the London are, ans possibly second-hand diesels from elsewhere, will replace (by 2019) the four-wheeled 'Pacer' trains and also the Class 323 electric units which are being transferred away. The DfT website includes more detail about improvements line-by-line. We reproduce below, in full, the section covering our line. A rather vague statement; we await more detail. Davenport and Woodsmoor are not mentioned specifically, which makes us suspect that - with the aspiration for faster trains from Buxton and recalling some ideas floated in the past - that some of the extra trains at Hazel Grove will run non-stop through our station. The quoted time savings are puzzling, as the fastest train from Buxton to Manchester is currently timed at 51 minutes, omitting Dove Holes and Middlewood and running non-stop from Hazel Grove to Manchester. Most trains during the day take 58 minutes 'down' or 60 minutes 'up' - their quoted savings by the fastest trains are apparently based on the current times of the slowest trains. None of these things are likely to happen immediately. The new trains will have be specified, tendered, designed and built. We understand that Swiss builder Stadler has expressed interest in the order, although no current Continental designs will fit British 'structure gauge' without modification, and new diesel engines will have to meet the latest EU emission standards. Also, it is not clear how the existing track layout and signalling in the Stockport area can handle the promised extra trains, including an increase in frequency to half-hourly on the Macclesfield and Chester lines. There is no mention in the document of changes in the role of train conductors, or de-staffing of more stations, proposed by the Government in recent times. Time will tell. The Winter Timetable period starts on 13 December and leaflets are available at the station and online as PDFs. The main change is that some trains towards Manchester which have been departing a couple of minutes earlier from Davenport during the leaf-fall season revert to their normal times. Additionally, the 17:39 and 18:39 departures, which have been terminating at Manchester Oxford Road during the engineering work on the Bolton line will now continue to Blackpool and Bolton respectively, and the 18:21 and 19:21 trains from Piccadilly to Davenport will be coming through from Blackpool instead of starting from Oxford Road. Visiting the Christmas Markets? Trains will be crowded in the run-up to Christmas. Northern Rail are providing four coaches on many trains, but even so, on weekdays there is likely to be more space on the ones which start from Hazel Grove, normally at 38 minutes past the hour during the daytime. Also, beware that if you buy a £3.40 'off-peak' ticket on Mondays-Fridays the last train you are allowed to return from Manchester is the 15:49 from Piccadilly unless you wait for the 18:49. The three-hour rule also applies inbound to Manchester: The 15:38 is the last 'off-peak' train from Davenport towards Manchester until the 18:38. Three hours of 'Peak' during which the adult return fares is £5.90 if you travel in either direction in the 'Peak'. Don't be tempted to buy a single each way, though, as you pay even more. You can pay the difference in fares at a starting station, apparently. If you are planning to return in the evening Peak time, and pay the £5.90, bear in mind that there is nothing to stop you also travelling in to Manchester during the morning Peak before 09:30. Deansgate station is closing at 18:00 on Fridays and Saturdays until Christmas, due to crowd control worries. You can, of course, use your normal 'MANCHESTER CTLZ' ticket on the tram from Deansgate-Castlefield to Piccadilly. There is now a Metrolink lift which goes up to the Metrolink station direct from ground level. The 'Christmas in the Park' event in Cale Green Park is scheduled for Sunday, 6 December (12:30 – 3:00). The highlights include Splat the Snowball (a seasonal version of Splat the Rat), a Chair O Plane Ride, a free Santa’s Grotto, and star attraction the Elmfield Brass Band. If the weather is good, there will also be a Reindeer Ride. Well, not exactly reindeers, more like donkeys with antlers. And home-made cakes and tea/coffee from the community room, crafts made by the local residents, a Hidden Santa Contest and a raffle. Great entertainment! And it's Free! As part of the event the Friends of Cale Green Park will be collecting rucksacks, sleeping bags, gloves, hats, fleeces, undies, socks and extra food in aid of the Wellspring Rucksack Project. These will in turn be distributed to homeless people and rough sleepers in Stockport. You can find out more about the project at www.thewellspring.btck.co.uk (click on The Ruck Sack Project 2015 link). You can also donate £5 via Text; simply text WRSP15£5 to 70070. For more information about the Christmas in the Park event, please visit the Friends of Cale Green Park website www.calegreenpark.org.uk or follow the Friends on Facebook [Cale Green Park]. November is the month when a lot of people head to town to do their Christmas shopping, and unfortunately also the month when the railway tends to let down its passengers. A spate of problems caused by poor rail conditions (i.e. leaf mulch) despite the running of 'Rail Head Treatment Trains' was followed on Sunday 15 November, when two trains had already been cancelled earlier in the day, by the failure near Davenport of a Network Rail measurement train heading from Stockport to Derby which blocked the line, resulting in the cancellation of the 16:37, 17:05, 18:05, and 17:38 arrivals from Manchester and the 17:15, 18:04 and 19:04 and 19:09 inward departures from Davenport towards Manchester. Apparently a rescue locomotive had to travel from Preston to move the failed train. The rail adhesion problems also inevitably lead to trains slipping with their wheels locked when trying to stop, which then grinds a 'flat' on the wheel. Davenport station is on a down gradient towards Manchester, and the line is lined with trees (outside Network Rail's boundary), which is why travellers will observe drivers making a very tentative approach to the station stop. It also explains the repetative knocking sound when can often be heard as trains with damaged wheels approach the station. What happens next is a shortage of carriages as they are taken out of traffic for wheel repairs. Few, if any, of these troubles can be attributed to the Northern Rail company who are dependent on state-owned Network Rail for their infrastructure. The autumn timetables begin on 5 October: we recommend that you check your train times before travelling. Some trains towards Manchester will be running a couple of minutes earlier than before as it is the 'leaf-fall' season - and also, most services which recently have been running through Manchester to Preston are extended to Blackpool North, also returning from there to Hazel Grove. However, some changes which were planned will not be happening, as Network Rail have announced that due to problems with sand, the rebuilt tunnel at Farnworth between Manchester and Bolton will not not be opening on 5 October as the train companies have been promised, but will be continuing until December at the earliest. This has delayed the production of the timetable booklet, but it is now available as PDF download from Northern Rail. Our line is now designated as a 'Community Rail' one, and Davenport, Woodsmoor and Hazel Grove stations have been allocated to the South East Manchester Comnunity Rail Partnership which has (although unknown to us) existed since 2010. Like other such Partnerships, this has an allocated Community Rail Officer, in our case it is Stephen Forde, who is based at Stockport Council's Fred Perry House offices. Community Rail Partnerships work to bring together the railways and the local communities. Their work includes bringing station buildings back to life, art and education projects and organising special events, such as music trains, which promote the railway and its relevance to the community. In the case of our line, however, no such local group has managed to develop in an active form, despite the efforts of some people over the years although we at the website have done what we can, including our little flower bed which you may have seen at Davenport, but there is much more that could be achieved. Other groups have campaigned for service improvements, which would certainly be welcome at out stations. Automatic Ticket Gates are in use at Stockport station from Monday 17 August, at each end of the subway. This has led to some controversy, as many people who use the subway at present are simply making their way from the Edgeley area towards the town centre, and the new Stockport Exchange development outside the station, with its supermarket and cafés, is likely to increase the numbers wishing to pass this way. It's possible to cross the line by the public footbridge from Shaw Heath to Thompson Street, then down the A6, but this is a longer route for many journeys. Virgin Trains, who have been required by the Government to install these gates, say that the gates will be staffed by 'Welcome Hosts' who will issue 'guest passes' to allow passage through the subway, and also allow people to 'see off' passengers. When the Hosts are not on duty, the gates will be left open. Ticket machines have been installed at the Edgeley end of the subway, but there are types of ticket which are not available from such machines, so some people will have to pass through to buy a ticket. Platform Z ero, from which most trains to Davenport depart, will have ticket checking staff provided by Northern Rail from the same agency as the people who have been seen at the bottom of the Platform 3/4 steps at present. So if travelling from the Edgeley area towards Buxton you'll have your ticket checked three times. If you arrive at Stockport without a ticket, which is very common as many stations are not staffed in the afternoon and do not have machines, we presume there will be someone in the subway to sell you one. How well all this will work in practice, on Stockport County home match days for example, remains to be seen, but it should have one advantage: if changing trains to travel south from Davenport towards London, etc. 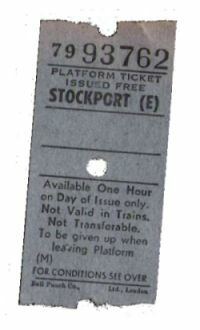 there will be no need to fish out your ticket to be checked at Stockport. Historical note: Older readers might recall that one side of the subway used to be fenced off the allow people to pass through, but since the lifts were made available to passengers this is no longer feasible. Back in the sixties, there were staffed barriers at each end, although the ticket offices were on the platforms. You would be given a free 'platform ticket' which you'd hand in when you bought a travel ticket. Illustrated is one which we failed to 'give up when leaving platform'. The Flowery Fields Allotments Association are holding an Open Day on Saturday 1 August from 10.30am to 2pm at their site, accessed from the end of Flowery Field, Woodsmoor or by the footpath from Ringmore Road & Kinross Avenue towards Woodsmoor station. There will be cream teas, produce stalls, tombola, kids' activities, information about Mirrlees Fields developments. Admisson is £1, concessions 50p, children free. The union also say Northern Rail has given no commitment that there would be no compulsory redundancies beyond the end of its current franchise in February 2016. This is hard to understand, since a different company will be running our trains then. Northern Rail's management reply can be found on their website. From 28 June 2015 to 'late August' no Metrolink services run through St Peter’s Square station, while it is rebuilt. Altrincham to Deansgate-Castlefield: 12 minute service with double trams. Altrincham to Cornbrook: Peak only 12 minute service with single trams. Bury to Piccadilly: 6 minute service (7am to 8pm Mon-Fri, 9am – 8pm Sat) and 12 minutes at all other times. Some double trams will run during weekday peak. East Didsbury to Deansgate-Castlefield: 12 minute service with double trams in the peak. Eccles to Deansgate-Castlefield via MediaCityUK: 12 minute service with double trams. Manchester Airport to Cornbrook: 12 minute service with single trams. Rochdale town centre to Ashton-under-Lyne: 12 minute service with double trams in the peak. A Metrolink shuttle bus will run from the Cornbrook stop direct to Piccadilly, while passengers will also be able to catch free 'Metroshuttle' bus services at Deansgate-Castlefield. Walking routes will also be signposted (see below). Hazel Grove line passengers heading for Metrolink points beyond St Peter's Square, during the daytime Mon-Fri at least, may find it convenient to catch one of the trains which runs through to Preston, and change at Deansgate where the bridge to the Metrolink station is now open again. Unfortunately, after 17:30 and all day Saturday, these trains are currently terminating at Manchester Oxford Road because of Network Rail engineering work. It is usually possible to change there to a Liverpool-bound local train to reach Deansgate, which might still be quicker than using a replacement bus. Metroshuttle 2: Piccadilly Station – Oxford Road Station – Deansgate Station – Spinningfield – Deansgate (Barton Arcade) – Victoria Station – Shudehill Interchange – Victoria Station – Deansgate Barton Arcade – Spinningfield – Deansgate Station – Oxford Road Station – Piccadilly Station. Metroshuttle 3: Piccadilly Station – MMU – Deansgate Station – MOSI – Deansgate Station – Oxford Road Station – Piccadilly Station. A PDF Map of the new routes is available on the TfGM website. All these stop running at 19:30, but route 3 runs later while St Peter's Square is closed. A Summer Event in Cale Green Park is scheduled for Sunday, 28 June (1:00 – 4:30). The highlights include Gez's Coconut Shy, a Punch and Judy Show, Ferret Races (to be confirmed), a Chair-O-Plane Ride, Face Painter, Donkey Ride, Bowls for Fun, Zorbing (to be confirmed) and our star attraction is Rock Back the Clock (a superb 50’s Rock & Roll band). There'll also be a Lakeland Picnic [Cumbrian lamb and 100% beef burgers], Osaka Jo's, and our traditional Hog Roast. There are homemade cakes and tea/coffee from the community room, crafts made by the local residents, and a raffle. 13 June 2015. Dear Mr Hulme, Thank you for taking the time to highlight this matter to us. I have passed your comments to our Information distribution manager just in case he was not aware of the error. Thank you again for contacting us and I hope you have not been personally inconvenienced by this shortfall. I'd like to draw your attention to a significant proof-reading error in the new Timetable posters from 17 May now posted at Manchester - Buxton line stations. Several trains on Saturday afternoons are shown as starting at Deansgate and terminating at Woodsmoor, whereas (of course) they actually start at Manchester Oxford Road and terminate at Hazel Grove. As a result of this error, the times at intermediate stations are shown as five minutes later than the correct times, e.g. 16:21 from Oxford Road instead of 16:16. It would be hard to correct this without re-printing the sheets: I suggest that you do this as soon as possible. A new timetable comes into operation from Sunday 17 May, and there are some changes to train services at Davenport. Leaflets are available at the station, and online. The main alterations in our area are connected with the work to electrify the Salford Crescent - Bolton - Preston line, which when complete will allow electric trains to return to Davenport on the Hazel Grove - Preston service, perhaps by the end of 2016. For the next few months, however, work at Farnworth Tunnel between Salford and Bolton will restrict the number of trains on that line, and it will be closed completely at weekends. On Saturdays, the trains which normally run through to Bolton or Preston will be terminating at Manchester Oxford Road station and starting from there on return, although running at the usual times. Connections towards Preston, Blackpool and Scotland via Wigan will be available, but Bolton passengers will need to use a replacement bus at weekends. On Sundays, most of our trains normally run to Manchester Piccadilly and will be unaffected; the Sunday Hazel Grove - Southport trains run via Wigan Wallgate and will also run as normal. Network Rail has a web page with a very interesting video about the work being done at Farnworth, which also has links to the temporary timetables. As we have explained previously, the Government instructed Northern Rail to require passengers to buy the more expensive 'anytime' instead of 'off-peak' version of train tickets if boarding any train in Greater Manchester on Mondays to Fridays between 16:01 and 18:30 as well as the traditional pre-09:30 period. This is meant to increase revenue and reduce overcrowding on evening peak trains, but it is a great inconvenience to many, especially those wishing to buy the combined train/bus and train/tram tickets as there is no 'peak' equivalent of these, although the buses and trams can still be used in the evening peak, if you find yourself returning by train between 16:01 and 18:00 you'll have to pay the extra fare. However, there is one incidental advantage. If you do need to return in the evening peak, then there is now no reason to wait until after 09:30 to start your day out as you can use the 'anytime' ticket before that time. Mr J.J. Battersby of Beechfield, Davenport Park, Stockport, of the firm of Messrs. Battersby and Company, who was saved at the sinking of the Lusitania, has arrived home and is not confined to his bedroom suffering from the effects of his immersion in the sea. Mr Battersby had a wonderful escape. When the ship was sinking he was swept off the deck, whirled against two staircases, and then he found himself drawn through the water at a tremendous rate. He had the presence of mind to hold his breath, but when he came to the surface he had almost lost consciousness. The Lusitania had disappeared, and Mr. Battersby states that he floated past a collapsible boat, and distinctly heard someone say, "Leave that man, he's done for." Mr. A. Quinn, [Alfred John Quin], the head bedroom steward of the second-class, however, dragged Mr. Battersby into the boat. There were thirty or forty in the boat, and they were afterwards picked up by the trawler Brock, but it was nearly eleven o'clock at night before they got into Queenstown. Mr. Quinn, to whom Mr. Battersby owes his life, returned to Stockport with him. Most of the passengers with whom Mr. Battersby became acquainted on board were drowned, including a lady who helped him to fasten on his lifebelt, and Mr. Battersby says it was a most painful experience to meet the relatives in Queenstown and tell them in what circumstances he last saw them. Mr Battersby lived until 1949. By a strange irony, his son James Larratt Battersby became a fanatical follower of Adolf Hitler, and was interned on the Isle of Man during World War II. As we predicted in an earlier item, from 13 April the evening services on bus route 374 which runs on Mondays - Saturdays between Stockport, Davenport and the New House Farm estate, which have been run under contract to Transport for Greater Manchester, will no longer operate. The last bus of the day from Stockport is now at 18:05, although there will be a service from Hazel Grove station towards Stockport via New House Farm at 19:50; there's a train from Manchester which arrives at Hazel Grove at 19:48, but since this is deregulated Britain, we can't recommend relying on this this connection. Better news is that Stagecoach have been able to win back the evening service on the 378 Stockport - Bramhall route, so their DayRider and other types of pass will be valid all day on this route. Our thanks to the Friends of Cale Green Park for the donation of the bulbs enabling us to plant these daffodils by the Buxton-bound platform entrance. In a temporary alteration related to engineering work on the Manchester Victoria area, on Good Friday, Easter Saturday and Easter Monday most of the Davenport daytime departures at 40 minutes past each hour will continue beyond Manchester to Southport via Wigan rather than Bolton or Preston as normal, with corresponding hourly return trains. An opportunity for a day trip to the seaside, perhaps. Check nationalrail.co.uk for details. On 27 February the Department for Transport has published its requirements for the Northern and TransPennine raiway operations in the form of Invitations To Tender. Also published is a Stakeholder Briefing Document, which summarises the responses received to the eariler consultation and explains what will be happening in the new franchises. Whatever organisation bids to provide all the above for the lowest annual subsidy will be awarder the contract to run the local railways.The Department’s aim is for the new Northern Franchise to commence operations with effect from 02:00 hrs on 1 April 2016. We understand that three providers have by shortlisted as 'preferred bidders': Abellio (Netherlands state railway), Arriva (German state railway) and Govia (partly owned by the French state railway). The current Northern Rail is jointly owned by Abellio and multi-national service group, but Abellio intend to 'go it alone' in future. It's a curious fact that rail 'privitisation' has led to many of our rail services earning money for foreign governments. Incidentally, the operator will be allowed to make over-inflation fare increases to fund the new rolling stock. There are also suggestions in the docoment that some trains might run without conductor/guards on lines where there was sufficient opportunity to buy tickets at stations. There's a spreadsheet provided which specifes the minimum number of trains which must be provided at each station. If we understand this rightly, in the case of Davenport this is much the same as at present on weekdays, the service between 10:00 and 16:00 remaining half-hourly. However, on Sundays from December 2017 the specification calls for a half-hourly service between Manchester and Hazel Grove for most of the day (mostly hourly at present), half the trains continuing to Buxton. Annoyingly, however, the current poor level of Sunday services to Middlewood is accepted, with its unnecessary inconvenience to leisure users of the Middlewood Way with no benefit to anyone else. A new timetable is in force from 16 February, although the changes are actually shown in the current Manchester - Buxton timetable leaflet. The principal change is that on Saturdays, trains running beyond Manchester will terminate at Bolton rather than continuing to Preston as normal. We are assured, however, that contrary to the impression given by the leaflet, the Saturday train which calls at Manchester Piccadilly at 17:21 will continue to stop at Davenport and Woodsmoor. In addition, following protests to their MP by Middlewood residents, it will also soon revert to stopping at Middlewood, a stop which was removed (leaving a three-hour gap in service) when Northern were persuaded (by our MP) to stop the train at Davenport and Woodsmoor. It does seem ridiculous to us that the railway planners have to be ordered by senior politicians to stop disrupting people's lives for the sake of a couple of minutes, rather than simply listening to the views of passengers, station adopters and user groups. Further to our earlier items, we can report that the 'Jolly Sailor' is open again with new and very pleasannt decor, including on the walls interesting framed pictures of historic scenes in the area. It is good that not only do we still have the place when so many pubs are closing, it serves excellent food and drinks too. Further news on bus services is less encouraging in that from March, Transport for Greater Manchester will no longer subsidse evening services on route 374 between Stockport, New House Farm and Hazel Grove, so the last 374 bus from Stockport will be at 18:05. On the other hand, Stagecoach will re-gaining the evening contract for the 378 bus, putting an end to the irritating situation where one can but a Stageoach 'Dayrider' for en evening out in Bramhall, only to find it is not valid on the bus coming back because it's run by another company. 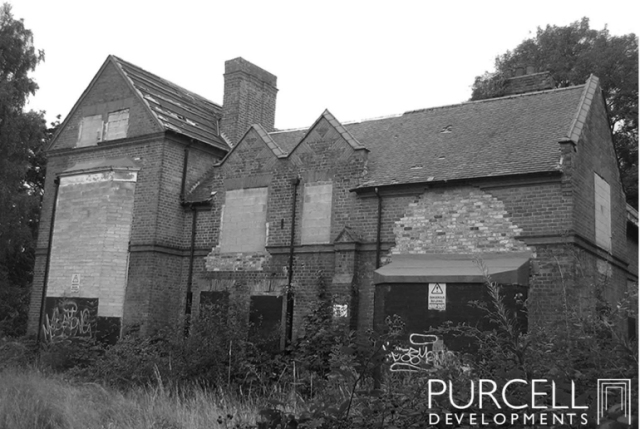 Members of the Local Community — Help shape our vision for the rejuvenation of the former St Georges Vicarage site. proposals which we hope will be fully supported by the local community. We have carried out extensive studies over the last several months which we would like the opportunity to share with you. We would like to gain your views on our proposals, and use your ideas to inform and shape our final plans for the site. happy to answer any questions you may have concerning our emerging plans for the site. We look forward to seeing you on the 16th and hearing your views and ideas. The 'Jolly Sailor' pub is closing at end of the evening on 25 January to undergo a 'Major Refurbishment'. Grand re-opening is planned for 6 February. Bus changes: From 25 January The 378 bus from Stockport to Bramhall is to revert to two buses an hour weekday daytimes, instead of three. The 374 bus will no longer continue beyond Stockport to Reddish, and on the Davenport / New House Farm section is reduced to an hourly service outside the peak times. Buses will travel by a longer route to Hazel Grove station via Cavendish Road and the 'Five Ways' then continue beyond Hazel Grove station to Stepping Hill Hospital. Timetable leaflets are available in PDF format from the TfGM website. In Manchester the footbridge from Deansgate station to the Metrolink stop has been closed for much-needed refurbishment. This means that, for the time being, changing from train to tram there, normally simple, requires a long walk to the far end of Deansgate Locks and a climb of several flights of steep metal stairs. 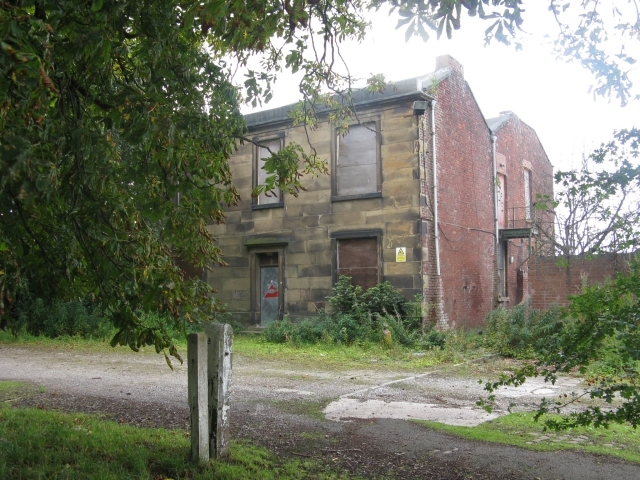 Bramhall House, a (just) surviving early nineteenth-century mansion alongside the Mirrlees Fields right-of-way - seen above in August 2014 - was demolished on 16 January, despite objections from local campaigners. Its site, along with the former factory site - but not any of the fields - is to become an estate of about 240 new dwellings. See the Mirrlees Fields Friends Group website for more information. The footpath towards the MAN entrance is now blocked, although a route may be re-opened in the future: the only way out to Bramhall Moor Lane is to turn left along Barlows Lane South. Be aware that fare increases have taken effect nationally from 2 January. Included in the changes is the very useful Wayfarer ticket: the adult version is now £12, although the Concession version remains at £6. Some good news is that there has been a very welcome relaxation of the recently-introduced and controversial 'Evening Peak fares' rules. Off-Peak Day Returns from Davenport to stations beyond New Mills on the Buxton line are now valid from 08:59 Mondays-Fridays, with no evening peak restriction, returning by any train the same day, and all day on Saturdays and Sundays. A Cheap Day Return to Buxton is now £9.70. However, this relaxation does not apply to 'Northern Duo' tickets which remain disallowed between 16:01 and 18:29. Cheap Day Returns to places outside Greater Manchester on the Crewe and Chester lines, changing trains at Stockport, are valid from 09:29, returning on any train, with no evening peak restrictions. Be sure to say when booking return tickets after 09:30 whether you are departing from Manchester or Stockport between 16:01 and 18:30 on Mondays - Fridays. However, should you buy the cheaper ticket and find a need to return in the 'peak', it is permitted to pay the difference at the ticket office before return travel, although at Piccadilly station there may well be a tedious queue. Booking a single ticket 'just in case' will be a more expensive option, as the fares listed above prove. The same applies to other Greater Manchester stations: and if your return journey from a Greater Manchester station involves a change of trains, be aware that the departure time of either train determines the fare, even if the starting time from your destination station is in the off-peak period. For example, if you are returning on the 15:49 from Urmston, changing in Manchester, you must have an 'anytime' ticket as the 16:16 connecting train from Manchester Oxford Road to Deansgate is within the 'peak'.